Fabric is a nightclub in Islington, London, England. Founded in 1999, it was closed down by authorities in 2016. Fabric began a campaign to save the club and the UK's dance music culture on the 16th September 2016. 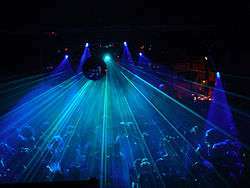 Fabric was later allowed to be reopened under strict laws. Located on Charterhouse Street opposite Smithfield Market, the club was voted World Number 1 Club in DJ Magazine's "Top 100 Clubs Poll" in 2007 and 2008  and ranked World Number 2 in 2009, 2010 and 2011. Fabric occupied the renovated space of the Metropolitan Cold Stores. Smithfield Meat Market stands and operates from a site directly opposite. The area's construction took place in Victorian times alongside nearby landmarks Holborn Viaduct and Fleet Valley Bridge. In 2010, Fabric briefly went into administration after its sister club Matter, with whom it had a cross-guaranteed loan, announced it would close for the summer due to financial difficulties suffered as a consequence of continued delays with TfL upgrade of the Jubilee Line. Fabric was put on the market on 1 June 2010. On 24 June it was announced Fabric was no longer in administration and had been bought by Fabric Life Limited, "a consortium who fully back [Fabric] founders Keith Reilly and Cameron Leslie's vision." The musical genres played there vary. FabricLive is a Friday-night "soundclash", including tempos from hip hop, breakbeat, dubstep, drum and bass and electro. Fabric's Saturday nights showcases house and techno. Craig Richards and Terry Francis are the club's resident DJs. Richards was also one of the Directors of Music Programming, selecting the lineups for Saturday nights, which have featured appearances by DJs such as Ricardo Villalobos, Carl Craig, Ellen Allien, and many others. Sundays at Fabric were promoted by Wetyourself, a polysexual event that had been running from February 2009 to its closure. The music policy was underground house and techno, with the occasional live PA.
A CD series was launched in 2001 under Fabric Records. It rotates monthly between Fabric and FabricLive, with the series showcasing established and emerging DJs. It is entirely independent and operated solely by Fabric. The full list of titles in the series can be seen at Fabric discography. On 19 September 2008, Reilly and Leslie opened the 2,600 capacity music venue Matter. Located in The O2, it was their first project outside of Fabric. Matter has since closed. Houndstooth is a record label from Fabric, started in February 2013. On 7 September 2016, after a review into the drug-related deaths of two people in the club, Fabric's licence was revoked and the venue was closed permanently, despite a campaign to secure the club's future backed and popularized by DJs, musicians, venue-goers and several politicians. London's mayor Sadiq Khan criticized the decision and placed it in the context of the city having lost 50% of its nightclubs since 2008, a "decline [which] must stop if London is to retain its status as a 24-hour city with a world-class nightlife". Following the closure, supporters of the club launched a social media and crowdfunding campaign supporting reopening the club. Over £200,000 was raised toward a legal fighting fund to appeal the council's decision. In November 2016, news reports stated that the council and the club's management were working on an out of court settlement that might lead to the re-opening of the club. On the 21 November 2016, Fabric struck and deal with Islington Council, with backing from the Mayor of London, to re-open the club. Conditions are as follows: a new ID system, covert surveillance system, a lifetime ban for anyone found dealing or in possession of drugs and no one under the age of 19 allowed between Friday 8pm to Monday 8am. ↑ djmag.com (2008-02-01). "Top 100 Clubs 2008". DJmag.com. ↑ djmag.com (2009-02-01). "Top 100 Clubs 2009". DJmag.com. ↑ djmag.com (2010-02-01). "Top 100 Clubs 2010". DJmag.com. ↑ djmag.com (2009-11-24). "Outstanding Contribution – Keith". DJmag.com. ↑ "Fabric: An oral history". RA.com. 2009-10-09. ↑ "Further delay to Jubilee Line upgrade". BBC. London. 2010-08-10. 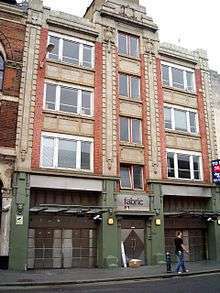 ↑ "Fabric nightclub put up for sale". NME. 2010-06-02. ↑ "Fabric: Out of Administration". RA. 2010-06-24. ↑ "Club (About)". fabriclondon.com. Retrieved 1 August 2011. ↑ "Label (About)". fabriclondon.com. Retrieved 1 August 2011. ↑ "Exclusive: inside Fabric's new club Matter". Timeout.com. 2008-06-17. ↑ "Fabric duo take Matter into their own hands". musicweek.com. 2008-06-17. ↑ "Fabric's Cameron Leslie speaks out". London: RA. 2008-07-13. ↑ "Label of the month: Houndstooth". 1 2 Rawlinson, Kevin (7 September 2016). "London nightclub Fabric to close permanently after licence is revoked". London: The Guardian. Retrieved 7 September 2016. ↑ Lynskey, Dorian (2016-09-08). "'Landmark clubs are evidence of creativity and energy in a city': why Fabric's closure matters". The Guardian. ISSN 0261-3077. Retrieved 2016-09-08. ↑ Aron, Isabelle (23 September 2016). "The crowdfunding campaign to save Fabric has raised more than £210,000". Time Out London. Retrieved 2016-11-21. ↑ "The owners of Fabric are reported to be in talks aimed at saving the venue". BBC Newsbeat. Retrieved 2016-11-21. ↑ COUVÉE, KOOS; COOPER, JOE (18 November 2016). "Deal to reopen Fabric at advanced stage after secret talks over nightclub's future". www.islingtontribune.com. Retrieved 2016-11-21.